Food, fun and prizes are in store as Skye Canyon unveils three appointed models at the First Look: Aspen by Century Communities grand opening event today, April 13 from 10 a.m. to 1 p.m. There are floor plans available that range from 1,731 square feet to 2,259 square feet, with prices starting in the low $300,000s. Food, fun and prizes are in store as Skye Canyon unveils three appointed models at the Aspen by Century Communities grand opening event from 10 a.m. to 1 p.m. this Saturday. There are floor plans available from 1,731 square feet to 2,259 square feet, with prices starting in the low $300,000s. With complimentary snacks, there is a chance to win great prizes like a $250 gift card to the Skye Canyon Smith’s Marketplace, a foursome of golf passes to Las Vegas Paiute Golf Resort and a Skye Canyon Prize Pack, including a Kleen Kanteen and North Face Jacket. The newest addition to the Skye Canyon master-planned community in the northwest valley, Aspen by Century Communities is a collection of single-family homes designed with the modern family in mind. 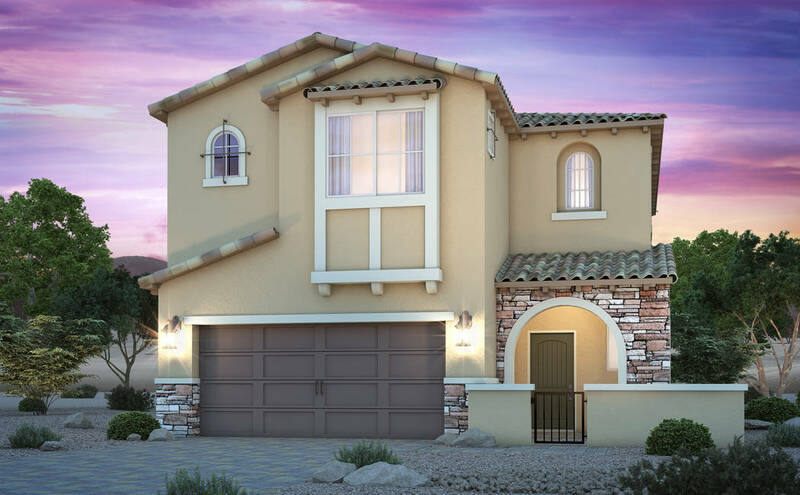 Each of these three- and four-bedroom homes offers gourmet-sized kitchens and open-entry courtyards to greet your guests and unwind with neighbors on warm evenings. The largest of the four available floor plans features a standard first-level den that can be built as a fourth bedroom to accommodate visiting friends and family. Skye Canyon affords each resident the ability to immerse themselves in the great outdoors with an abundance of open spaces distributed throughout the community. Designated bike lanes and extensive trail system for walking and biking, parks, landscaped arroyos and regional trail connections create an expanded living space beyond your own backyard. Find a host of shopping and dining options in the Skye Canyon Marketplace, where Las Vegas’ first Smith’s Marketplace opened last summer. The 124,000-square-foot store contains a full-sized Smith’s grocery store, with 60,000 square feet of household and decor items, family apparel, dine-in or take-out meals, a drive-through pharmacy and other essentials. Several other retailers are slated to follow in the months ahead. After touring Aspen by Century Communities, prospective buyers can stop by the Skye Canyon Home Finding Center to learn more about the amenities available at Skye Canyon, including the 15-acre Skye Canyon Park — home to Skye Center, the community’s social hub with an open-air bistro and indoor-outdoor fireplaces and Skye Fitness, a 10,000-square-foot workout facility with an outdoor junior Olympic-sized pool exclusively for residents. Located on U.S. Highway 95 at Skye Canyon Park Drive, Skye Canyon is a 1,000-acre master-planned community that offers a variety of homes for entry-level, move-up and luxury buyers who share a passion for outdoor activities, wellness and immersive living. Learn more at skyecanyon.com.